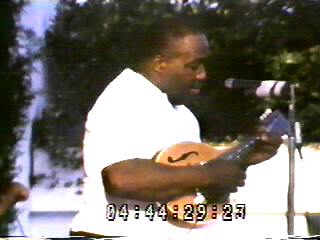 Chicago's Johnny Young was another entry on the very short list of recording blues mandolinists. According to James Solberg, one of his sidemen, Young tuned his mandolin DGBE, like the highest four strings of a guitar—but I've seen it alleged elsewhere that Young later switched to standard tuning. Here's a short video clip of Young performing, and here's some information on the CD Johnny Young: Chicago Blues on Arhoolie Records.